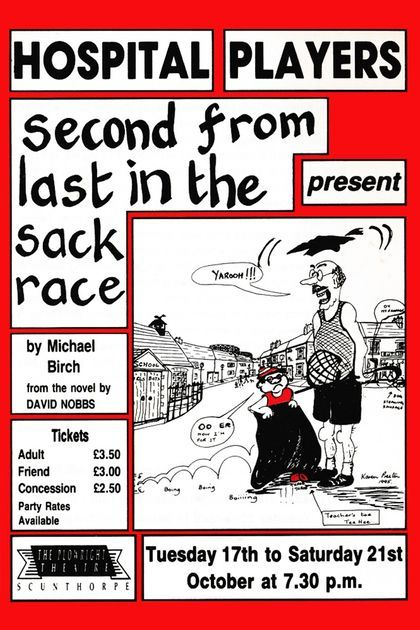 A wry, funny and very entertaining play by Michael Birch, adapted from the novel of the same name by David Nobbs, author of 'The Fall and Rise of Reginald Perrin,' 'Second From Last in the Sack Race' traces the ups and downs in the life of young Henry Pratt. Born in 1935 in a back-to-back in the north of England, Henry's childhood is disrupted first by the war, then by the death of his mother, followed shortly by that of his father. Entrusted to the care of his social-climbing Aunty Doris and Uncle Teddy, Henry is soon packed off to prep school in the south of England and then public school, where, once again, he has to make major adjustments to a new way of life. Just as everything seems to be working out for him - success at the school concert, summer abroad with his posh friend's family - disaster strikes as Uncle Teddy finds himself in severe financial difficulties and Henry is whisked away back up north, this time to live with grown-up cousin Hilda. Despite all these upheavals, Henry reaches the age of eighteen a reasonably well-adjusted young man, and the play ends in 1953, as he begins his National Service.